K-9 Officer Scott Beaumier is the handler of “Echo”, a mix of German Shepherd and Belgian Malinois. Echo is considered a multi-purpose police dog that can assist in tracking people, lost children, people with dementia, and suspects attempting to evade officers. Echo can also perform drug searches and provide officer protection during escalated events. Recognizing that certain types of situations involving individuals with mental illness require a specialized response from law enforcement, the Pleasant Prairie Police Department have specially trained officers who assist in identifying when someone in the community may be experiencing a mental health crisis. Crisis intervention gives frontline officers the tools to better communicate with people in crisis and get the individual the help that is needed. The main goals of the honor guard are to honor law enforcement officers from all over the nation and to serve the community of Pleasant Prairie as a representative group from the Police Department. The Honor Guard is responsible for a variety of services including upholding traditions of the police service; presentation and preservation of federal, state, and local flags; ceremony preparation and participation; and organization of services to department members at the time of due respects. 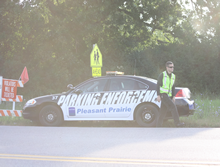 The Pleasant Prairie Police Department has a team of officers specially trained for the investigation and reconstruction of major traffic crashes. Our crash investigation team uses a Trimble Total Station laser surveying system to take the measurements which are then downloaded into a computer aided drawing system to produce three dimensional drawings and animations. The software can also calculate vehicle speeds based on the evidence collected. All of this information is used for criminal prosecution and civil litigation. Pleasant Prairie Police Department has one Harley Davidson motorcycle which is operated by 1st Shift Motor Officer Tim Sheffield. 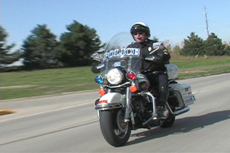 The motor unit is in service during the spring, summer, and fall. Besides being utilized for normal patrol, it is used for traffic enforcement and for special events such as triathlons and parades. Officer Andrea Brey represents Pleasant Prairie Police Department on Kenosha County Sheriff Department’s Crisis Negotiation Unit (CNU), a support unit of Kenosha County’s Tactical Response Team. CNU members communicate with individuals in crisis who have caused, or imminently threaten to cause violence, in attempts to diffuse emotionally charged situations, with the goal of a peaceful surrender. The Pleasant Prairie Police Department School Resource Officer services Lakeview Technology Academy, Whittier Elementary, Prairie Lane Elementary, and Pleasant Prairie Elementary. The School Resource Officer is a specialized assignment and is trained by National Association of School Resource Officers. NASRO training instructs the officer in the use of police powers and authority in a school environment. Informal Counselor - Be a mentor to the students. The Goal of the School Resource Officer is to be a positive role model to students and staff while educating in the law enforcement realm and provide a safe school environment. The primary responsibility of the Parking Enforcement Officer is to patrol assigned areas (specifically RecPlex, Prairie Springs Park and designated retail establishments) enforcing the Village of Pleasant Prairie’s Parking Ordinances by issuing tickets to overtime parking violators and illegally parked vehicles.